Sign Language in Action is a new book just published by Palgrave as part of the Research & Practice in Applied Linguistics series. The book is co-authored by Jemina Napier and Lorraine Leeson, who both have extensive experience as sign language researchers, educators and interpreter practitioners – Jemina in the UK and Australia, and Lorraine in Ireland, with briefer stints in Belgium, the UK and the USA. We have both conducted research and written extensively on various topics which can be considered under the umbrella of applied linguistics, including sign linguistics, sign language discourse, sign language and identity, sign language learning and teaching, and sign language interpreting and translation. After many conversations on our mutual research interests, we decided to collaborate on writing this book to draw together all the threads from our research into one overview. So the book defines the notion of applied sign linguistics by drawing on data from projects that have explored sign language in action in various domains. The data sources have been drawn from various studies have been conducted by us both. As well as defining key concepts and giving an overview of existing research, the book provides clear guidance on conducting applied sign linguistics research, with suggestions for new research topics. The book is targeted at sign language and sign language interpreting students, sign language teachers, researchers, interpreter practitioners and educators, Deaf Studies teachers and students, educators working with deaf children, and policy makers. It will also be of interest to other people working with minority language communities and to scholars and practitioners in applied linguistics research more generally. Following on from an earlier blog post by Jemina that discussed the ethics of conducting sign language interpreting research without deaf people involved, we feel it necessary to position ourselves in relation to the focus of this book, as neither of us are deaf. So here, we discuss our role as hearing people doing sign language research, and our goals in writing this book. The involvement of non-deaf people in the deaf community has been an on-going and vexatious issue. There has been long recognition of the value that ‘hearing’ people bring to the deaf community if they embrace the values of the community and can sign fluently enough to engage with deaf people. There have been attempts to separate the identity of hearing people that are involved in the deaf community from those ‘other’ non-deaf people who do not use sign language and who are considered as ‘outsiders’ (see Napier, 2002; Ladd, 2003). In the USA, there is currently much debate about the notion of interpreters having ‘Deaf-HEART’. Others have suggested that there should be no reference to audiological status, and instead we should refer to a community of ‘sign language users’ (Bahan, 1997), ‘sign language persons’ (Jokinen, 2001) or ‘sign language peoples’ (Batterbury, 2012; Batterbury, Ladd & Gulliver, 2007). Whichever convention you prefer, we identify ourselves as hearing people; we align ourselves with deaf people and their values based on our long involvement in the community, and we bring that subjectivity to our research and our writing. There is also much debate in the deaf community and among researchers about the potential oppression that deaf people face in having non-deaf people conduct research on their community, with emphasis on the need for research to be with deaf sign language users (Sutherland & Young, 2014; Turner & Harrington, 2000) and to adopt a ‘community participatory approach’ (Emery, 2011; Napier & Sabolcec, et al, 2013; Young & Temple, 2014). We do not see ourselves as positioned only in Deaf Studies. As linguists and interpreting studies researchers we see our work within a broader context of applied linguistics and intercultural communication, and the languages that we work with happen to include signed languages. Thus our focus in our book is on sign language use, and not deafness. We acknowledge though that although we are allies of the deaf community, we are not deaf, and therefore do not have shared life experience with deaf people. We are guests in the deaf community (as suggested by O’Brien & Emery, 2013), but we do have a strong philosophy of collaboration with the deaf community collectively and individually in all our research and practice. We believe that it is important for deaf and hearing researchers to work together for the best interests of the worldwide deaf community, but we recognise the power we have as hearing people in the community and the historical backdrop of hearing researchers dominating the field. We have ‘hearing privilege’, but privilege does not always have to occupy a negative position. We would assert that we accept the responsibility of having hearing privilege (Storme, 2014), and we use our hearing privilege positively to broker engagement and educate inside and outside the community. Because of our hearing privilege we get invited to do things like write a book, but we believe that we act in a way that is congruent with deaf cultural norms and values, and one of those values is reciprocity. Adam (2015) talks about the importance of disseminating information about sign language research in sign language, and you will notice that the majority of blog posts about sign language research on the LifeinLINCS page have links to signed versions (including this one). We would like to take this one step further – all the royalties from this book will be donated to the World Federation of the Deaf to support their on-going work with deaf sign language users throughout the world. So we are using our hearing privilege to give back to the deaf community. 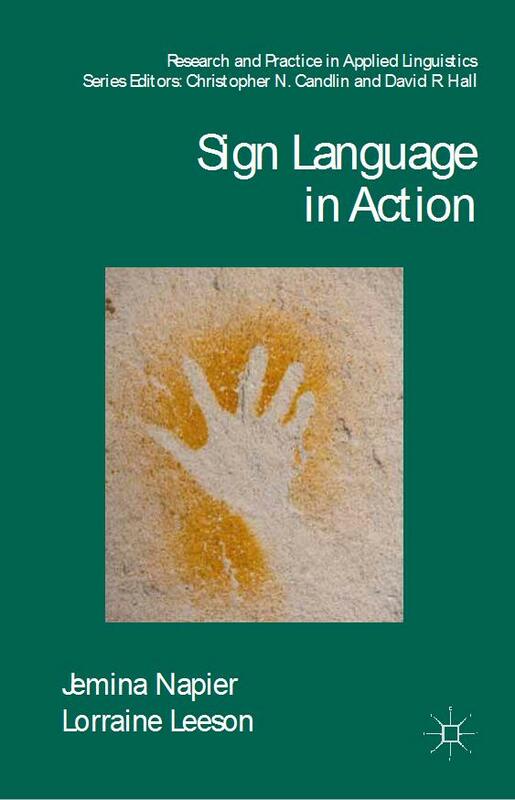 This book focuses on sign language in action; where and how it is used, who by, and how we can research sign language in action in order to better understand the relationship between sign language use, culture and identity. For us, we have deliberately focussed our discussion on how deaf and hearing people use sign language, and the implications for learning and teaching and professional practice, in the hope that the information in the book will benefit all sign language users and the values of the deaf community worldwide.